Rated as one of the fastest sit-on-top tandems on the market, the Zest Two is perfect for a day trek or weekend adventure. 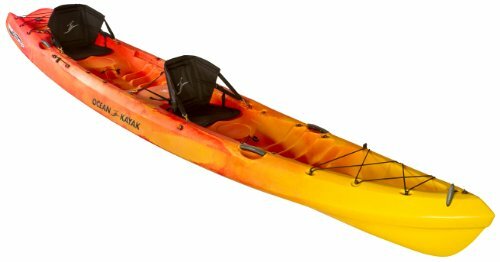 It's also the perfect touring kayak for warmer paddling environments where you may not want to be confined to a cockpit. Load it up. The Zest has tons of storage. FEATURES: Two Comfort Plus seats, molded-in foot wells, oversized tank well with bungee, molded-in cup holders, side-mounted paddle keepers, bow deck bungees SEATING: Seats two adults, plus a small child or pet SPECIFICATIONS: LENGTH 16' 4.5", WIDTH 30.5", SEAT WIDTHS 19", 18", 15.75", WEIGHT 75 lbs., MAX CAPACITY 500-600 lbs.